All Torque, No Compromise: The precisely powerful E-TEC G2. Direct injection optimizes all elements of how fuel is delivered into the cylinder and combusted fuel is removed, creating the most efficient engine on the water today. 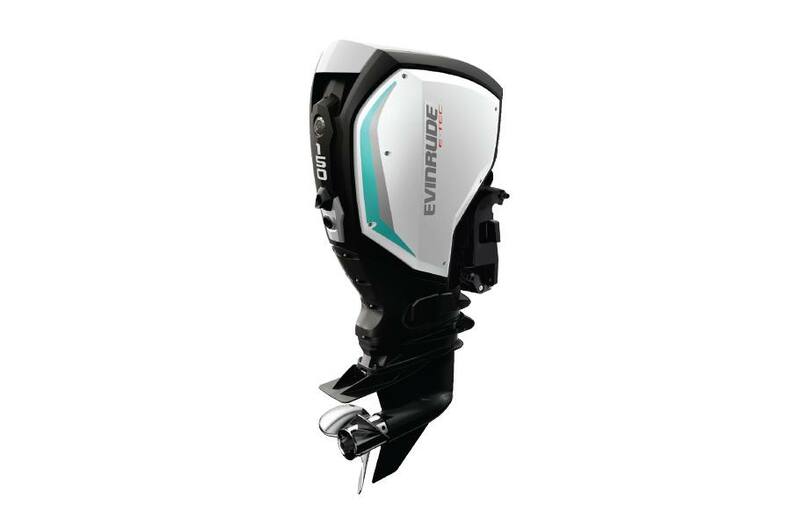 By using advanced computer software designed to analyze this combustion process, the Evinrude E-TEC G2 can achieve up to 30% more torque. Water-Friendly. Fuel Friendly. Family Friendly: Run the cleanest outboard on the planet, period. The PurePower Combustion of an Evinrude E-TEC G2 is so clean burning that its reportable emissions are lower than any other engine in its class. Not just clean, but lean too. With up to 15% better fuel efficiency, no competitor takes you further on a tank of fuel. Engine Type: V6 66° E-TEC D.I. * Variable Voltage Computer Controlled 133 Amp. Current amp calculated at 13.5 V. Net dedicated battery charging power output is 50 Amp. ** 3 years of BRP Limited Warranty and 2 years of BRP Extended Service Terms B.E.S.T. V6 66 deg. E-TEC D.I. Intelligent Docking at an intelligent price - PLUS - 10 years of factory backed, non-declining, fully transferable coverage. Offer valid only to qualified buyers on purchases of engines bought for recreational use only. Excludes engines purchased under commercial, professional, and government programs. 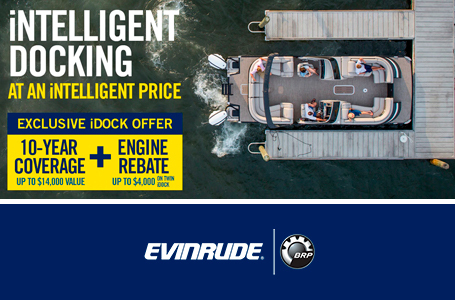 Offer is valid in North America only on new and unused Evinrude E-TEC engines purchased, delivered and registered between 4/15/19–6/30/19 at an authorized, participating Evinrude dealer. *10-YEAR COVERAGE: Subject to all exclusions, limitations of liabilities, and all other terms and conditions of BRP’s standard limited warranty and B.E.S.T. contract, including without limitation the exclusions of damages caused by abuse, abnormal use or neglect (see B.E.S.T. contract for specific details of coverage and exclusions). Offer effective on all new and unused 15 H.O. and above Evinrude E-TEC outboard engines. Eligible models will receive 10-year coverage (3 years of BRP Limited Warranty and 7 years of BRP Extended Service Terms [B.E.S.T.] coverage) subject to a $50 CAD deductible on each repair. 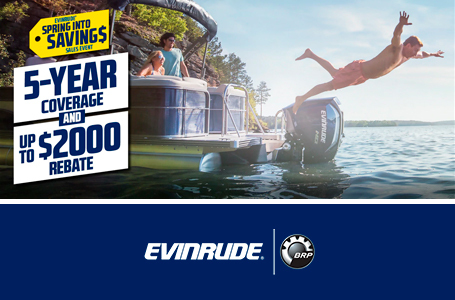 Evinrude Jet Series engines are eligible for 10-year coverage offer on the upper unit only. The jet pump assembly will only receive a 3-year BRP limited warranty. **VALUE UP TO $14,000: Approximate retail value of 5 years BRP Extended Service Terms coverage is based on number of HP and is up to $14,000 CAD for two (2) E-TEC G2® 300HP engines. †UP TO $4000 REBATE: Offer effective on all new and unused 150 H.O. and above Evinrude E-TEC G2 outboard engines. Based on horsepower, consumer will receive a discount which is to be denoted on the bill of sale, off of the purchase price agreed upon with qualified, authorized Evinrude dealer. Rebate amounts are as follows: $4000 CAD rebate on twin 200 H.O.–300 HP models, and $2000 CAD rebate on twin 150 H.O.–200 HP models.